Keter’s two snazzy round deck boxes named Circa exhibit an alluring presence of either wood-slat styling or the chicness of rattan appearances meanwhile their entirely weather-resistant design briskly snaps together during a tool-free assembly to fulfil 3-way storage, seat & table services at an affordable price. 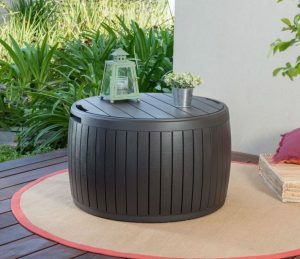 The Circa delivers superb value for money, it’s basically a round outdoor storage box that stands the typical deck box height making it ideal for positioning as a side-table or centrepiece to serve drinks along with providing alfresco dining & barbecue services within your outdoorsy seating area. Favourable locations for stationing the Circa are typically patios, barbecue decks & serving poolside due to their complimentary design. Indoors they attractively accompany conservatories meanwhile up-above located on the balcony their medium size discreetly serves & becomes your favoured storage companion. Creating the choice of either, a stylish circular wood panelling impression or an artistic wicker appearance incorporates around the bowed sides further to exhibiting the rich natural beauty of wood alike textures and shades in order to compliment the furniture & decor of a patio’s oasis with an appealing presence. Best described as barrel shaped, the lid opens access to 37 gallons (140 litres) of storage accommodation. Like one lady mentions, it holds her 2 large seating cushions & 3 scatter pillows along with sheltering an abundance of outside accessories meanwhile many appreciate the adequate expanse of the table-top for entertaining purposes suchlike playing cards, dominoes or games-nights with friends and the kids. The Circa stands the perfect height for stationing the new designs of table-top fireplaces, many create a more homely environment by placing ornaments on top, a few mention it’s the perfect storage compartment for pool supplies whereas most of us admire the convenience of organising books, magazines, games and cushions etc outside within a weatherproof vented dry enclosure. Reviews come across remarkably strong with regards to maintaining dry internal conditions throughout the warm seasons downpours, providing an ideal vented environment for storing cushion materials without developing musty odours. Circa’s storage box / table is also ruggedly designed heavy-duty virtue of chunky walls and caters to accommodate a comfy adult’s seat, boasting a weight capacity of 308 lbs (140 kg) which to my reckoning equates to around 22 stone, therefore supports most of our weights. A circular deck box trumpeting out Circa’s triple services are surprisingly rare with competition. To my current knowledge Keter seem to standalone yet this style receives awesome feedback along with exceptional value for money, maybe they’ve cornered the market. 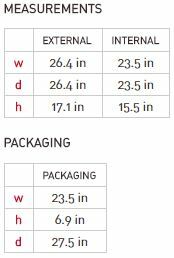 My previous Deck Box Reviews page links to the conventional deck-box competition, those that are highly approved by enthusiastic feedback meanwhile if a cube shape is preferred, check out Keter’s Square Deck Box, providing similar services to Circa’s barrel shape with a more spacious ’55 gallon’ storage capacity. Circa’s green make-up comprises an eco-friendly imperishable polypropylene manufacture. 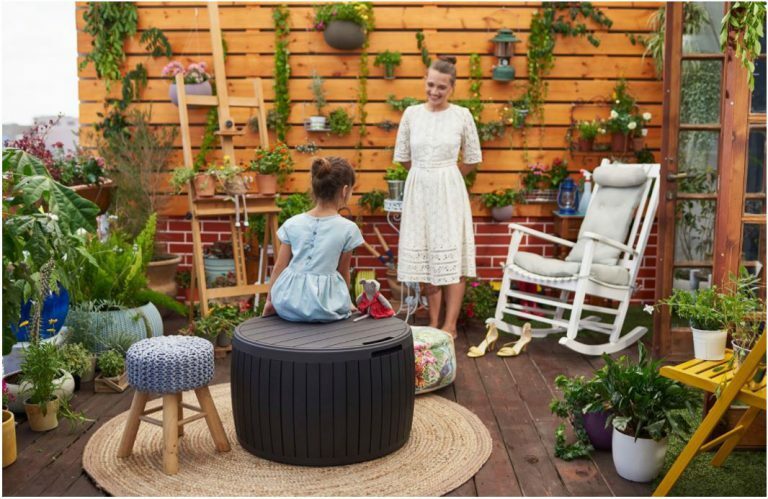 Albeit the resin assures longevity being immune from decomposing, the entire composition is recyclable therefore rolling on the years when the time comes to update the patio furniture maybe this plastic will be reused into the new futuristic styles of outside storage boxes – who knows! UV inhibitors intermingle within the polypropylene to armour & defend the composition against the onslaught of sunburn forces fracturing and bleaching the manufacture when exposed to sun-rays on hot summer days. Thanks to groundbreaking manufactures along with innovative techniques in the way molding methods style fascia panels, imitating mirror images of artistic wooden creations are craftily produced encompassing remarkably realistic similarities. The Circa provides two options: Firstly, by molding a wood-slat bowed-wall presentation comprising subtle grain details or the most elegant rattan weave that encircles the barrel with exquisite craft meanwhile both containers are integrated with a base and topped off with the same flat panelled lid resembling wood thereby enabling table-top services. We’ve covered the advantage of polypropylene’s resistance to rot & corrosion. Okay, the Circa is not designed for nurturing with varnish nor decorating with paint but what about maintenance? Boasting a time-saver of a cleaning operation, buffing up appearances is similar to indoor furniture however instead of furniture polish, a quick wipe over with a warm wet cloth restores construction day’s presentation in a jiffy. Circa’s design aids to organise a conglomerate of outdoorsy things, is maintenance-free and delivers convenience to any outside seating space meanwhile re-positioning the box to another location is catered for by using the hand-grips molded into the top circumference lip. If you’re on the lookout for a real basic installation method that constructs in a few shakes, Circa’s 5 minutes assembly process is sure to impress meanwhile requires no tools. Circa’s ‘5-minutes tool-free’ installation represents a similar configuration Keter’s Comfy deck box that stores 71 gallons, if a rectangular curvy shape is preferred. Delivered flat-packed, Circa contains side panels, a base, top rim and lid along with instructions containing 6 basic illustration steps that require implementing. Keter suggest using gloves during constructing. The premise of the build regards positioning, pressing and snapping into place each of the 8 side panels followed by clicking together the lid rim & base and you’re done. 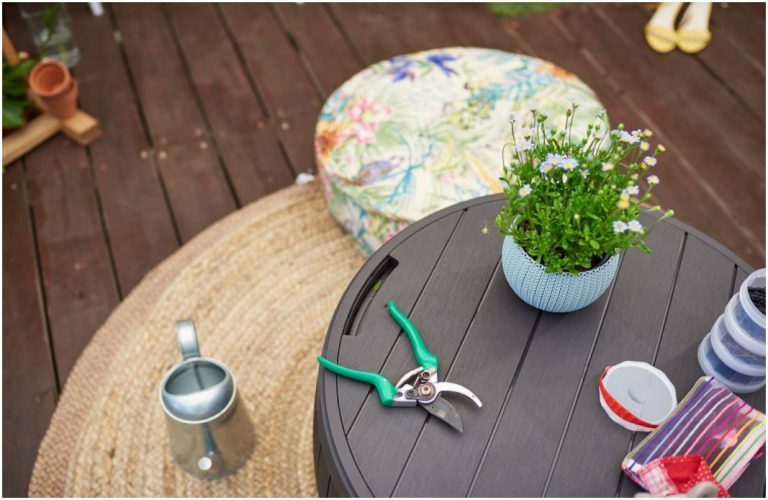 Purchasers describe constructing as uncomplicated & brisk, resulting in an operational circular deck box, stocked up with accessories & serving to full potential within minutes – Yippee to that! 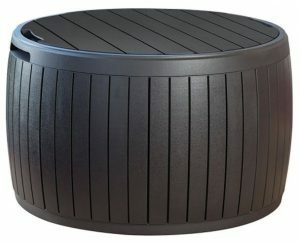 The advantage of Circa relates to a clever rotund barrel shaped design whereby solutions for storage are accompanied by providing an adult seat along with a level top that’s highly convenient for outside dining, drinks and playing games along with conveniently storing your outdoor accessories. Inside, vented conditions are generated through the faint gaps situated in the construction’s interlocking mechanisms for the purpose of achieving a brisk snap-together assembly along with delivering fresh air to combat musty atmospheres affecting fabric materials. This design isn’t waterproof, it will leak of you immersed it in the pool however it is formed weatherproof for rainwater to drain off and maintain dry internals when suffering the downpours. 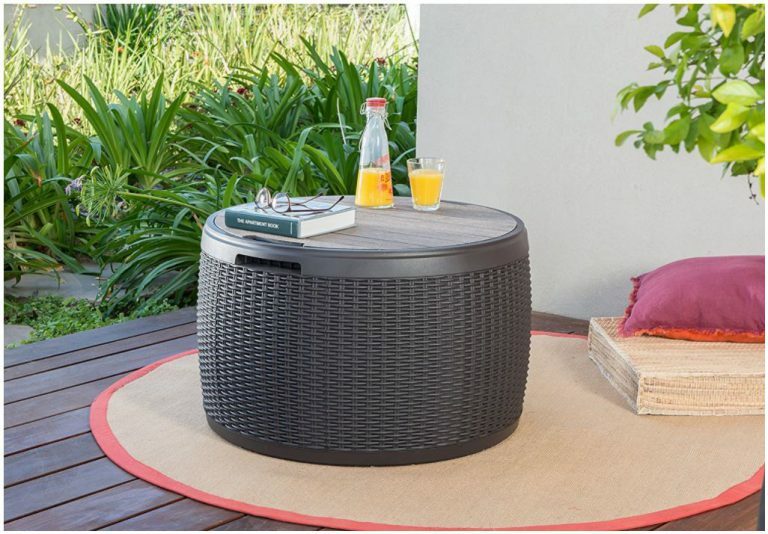 Two styles have currently been created, one displays barrel shaped wooden panels, the other presents a rattan style meanwhile both enhance outdoor seating areas with sublime presentations. Couple all these benefits along with the abundance of positive feedback, 2 years warranty and the most reasonable set of prices, there’s no disputing Circa’s popularity. 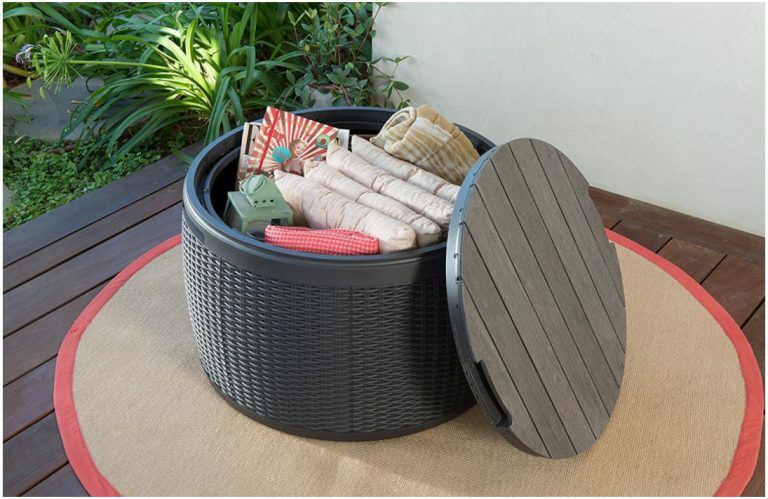 Hope Circa’s round deck boxes have generated plenty of inspiration for your outside seating area. Please share your preferred deck box design below. Do you prefer the cube, conventional style or this circular design? Please share Keter’s Circa. Thank you. Oh I love this round box! I just check the price and couldn’t believe how affordable it was. I will be ordering one of these for next summer! I love it for its multipurpose usage. It’s great for storing, seating and even a table- a win win all around. I was worried about the weight it could hold a person but it looks like it can withstand 308 lbs! That’s pretty hefty. Hi Dinh, Keter Circa deck boxes are very reasonably priced – they’re an ideal outdoor storage solution to accommodate small outdoorsy accessories. It’s surprising how much use a flat lid will be used as a table situated outdoors, we use our larger style stood on the patio for alfresco dining and drinks etc throughout summer, meanwhile, like you mention, this model’s sturdy enough to provide adult seating (308 lbs), another asset when friends visit. It’s good to know that assembling the deck boxes would be uncomplicated. I can’t make up my mind between the wood paneling and rattan weave pattern. They both look great! I like that it also doubles up as a storage box. Thanks for the recommendation! Hey Yvonne, assembly really is a cinch. I was highly impressed with how quick Circa constructs, there’s only 6 steps – try and beat a 5 minutes installation, amazing. 8 slightly curved wall panels all snap together to produce the barrel shape followed by clicking the structure onto the base and then snapping on the top circumference lip whereby the lid turns within to accomplish closing the box. There’s no tools involved, not bad hey, although Keter do recommend wearing a pair of gloves for interlocking all the panels together. Most recent deck box designs are following suit with these quick interlocking assembly methods, they please purchasers due to many of us having time constraints not forgetting inexperienced DIY skills meanwhile essentially the faint gaps presented within the interlocking mechanisms deliver fresh air inside to overcome musty atmospheres developing. Most incorporate hinges which require a screwdriver to secure, but not the Circa due to the circular flat lid that turns to seal and lifts off to open. The Circa attractively delivers 3 services Yvonne: Storage, an adult’s seat and a flat top to serve drinks & food. 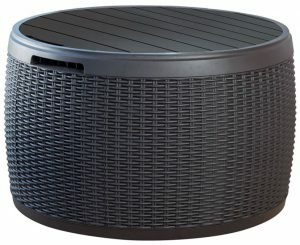 Hi Simon, I think a round deck box might solve the issue I have with my outdoor space. One of my balconies gets very exposed to high winds which presents me with a dilemma because I’m very partial to an outdoor cushion. A few times I’ve found my cushions blown right up the street in high winds. I hadn’t thought of storage for them (not sure why!) but I think a deck box might be the answer, and the rattan style one matches all of our existing furniture. It looks fabulous too and would make an excellent side table. Thanks for your review Simon and all the very best. Hey Melissa, doesn’t the Circa exhibit an elegant guise. Presented in either a wood barrel shape or rattan styling complements small outside seating areas a dream, their intentions are for locating on balconies, a sun porch, confined decked areas or poolside where space is restricted. If you’ve currently got rattan style outdoor furniture, Circa’s rattan effect should elegantly complement similar designs. Yeah, I bet wind can represent problems with balconies due to their higher location however Circa provides a wind-solution by opening the top and placing cushions and pillows inside to shelter against high winds when not in use, problem sorted! Along with providing an adequate 22 stone seating capacity for an adult they also triple up services with a flat-lid surface where you can use as a side table, position between 2 chairs to accomplish your unique bistro design or station centrepiece. thank you so much for for your informative review of weather resistant sheds. 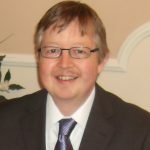 Searching the internet gave me your website and I’m so glad I found you! These storage containers are exactly what I was looking for and will work beautifully around my pool for storage and for function. I prefer the cube design and will. e placing an order with you. Hey Christy, thanks for taking a browse around the various quality plastic sheds and low maintenance outdoor storage solutions including these stylish deck boxes. Comprising a make-up of weather-resistant resin is something we searched for in order to dodge the ongoing maintenance battles of wooden storehouse stood outside, we’d been confined to years of conserving with wood preserve & varnish. So glad to be shut of all the rotting dilemmas we were continually confronted with. Nowadays our shed only requires a quick wash to restore its presentation and it takes minutes rather than days to what we were previously confined to. Seeing the potential regarding the ‘jiffy of maintenance’ soon turned our thoughts to a deck box constituting the same kind of manufacture. Providing threefold storage, seat & table services delivers convenience for our concerns located on the patio during the spring & summer months, it’s great. I think the wooden manufactures have mostly been replaced by plastic nowadays, a flattish top made from wood simply can’t survive the downpours without succumbing to decay meanwhile topping a wooden deck box off with roofing felt looks unsightly, resin’s the way forward. The Deck Box Cubes are very popular too Christy, Keter’s Storage Cube seems to be a more favoured choice due to increasing the internal storage capacity to 55 gallons therefore holds more pool supplies, swimming equipment and towels if wishes are to locate poolside meanwhile still assists as a table top along with supportive seating for an adult just like the Circa. I love the circular wicker design of the Circa Storage box. It’s super stylish and I particularly like that it doubles are a table! The hard wearing weatherproof design and two year warranty certainly make this handy two in one storage box/table appealing to those who desire a classy outdoor storage solution! Thus is definitely one I’d consider for my patio this season! An excellently detailed review. Thanks Simon! Hey Lace, the circular style is rather elegant and seldom seen which is surprising. Having said that, this deck box is very reasonably priced, has achieved global sales and receives top-notch feedback so maybe Keter have cornered the round deck box market with Circa’s bonny exhibit, I’m not sure! Finding a deck box that we could safely place our drinks and food on top without them skating around was a particular requirement for us. The convenience provided having a drink outside whilst making the most of the summer’s sun, or when friends visit for barbecues or simply having a snack outside on the patio, we find doubling up with these services a really smart solution meanwhile if you choose one like Circa that caters for seating as well, they’re even more beneficial when the patio’s full and seating becomes scarce. Most deck boxes have a 2 years warranty cover, whereas some have up to 10 years however for the value what’s on offer here compared with the low price, I think the Circa’s extremely good value for money. Wow, those are a really clever way of storing items on your deck or porch. I love the way you can paint them, that way you can make them match the different decor. The fact that you can sit on it too is great I would make a nice round pillow to place on top of it that matches my chairs. This is a great accessory for any family like mine with children, our children leave a lot of toys outside. Thanks for this review! Hi Melissa, these are a smart solution for organising storage in confined spaces, I agree meanwhile not forgetting their usages as supportive seating for an adult weighing up to 22 stones along with a flat levelled surface for accommodating drinks and food without slipping around. You can see real potential these threefold services provide for balconies, small BBQ decks and restricted porches like you suggest that cater for outside seating. The Circa is not for decorating Melissa. The polypropylene that constitutes the make-up is not deigned for colouring with wood-stain nor paint, the reason Keter have produced a dark oak shade because this display and style generally accentuates with most furniture, backdrops and outdoor surroundings. Great idea to design & make a pillow to fit the circumference for seating and when you’re finished having a rest after soaking up the sun or rainfall showers start to fall, open the lid, plonk it inside and the material will keep safe & dry – how convenient’s that? Deck boxes are hugely popular for toy storage. 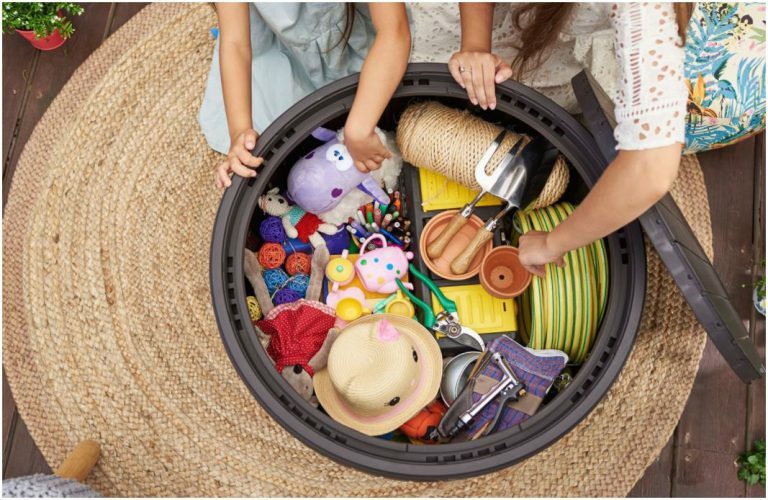 Most manufacturers have taken on board their popularity by installing gas shock pistons or spring hinges to aid lifting the larger deck box lids because their forced pressure stops hefty lid-weights crashing down and causing accidents by trapping fingers, not that this would be a concern with the Circa but certainly describes how popular outdoor toy storage is with regards to deck box services. Wow, these deck boxes are great, I have a little garden not a big one. I was looking for something exactly like these deck boxes and here it is. 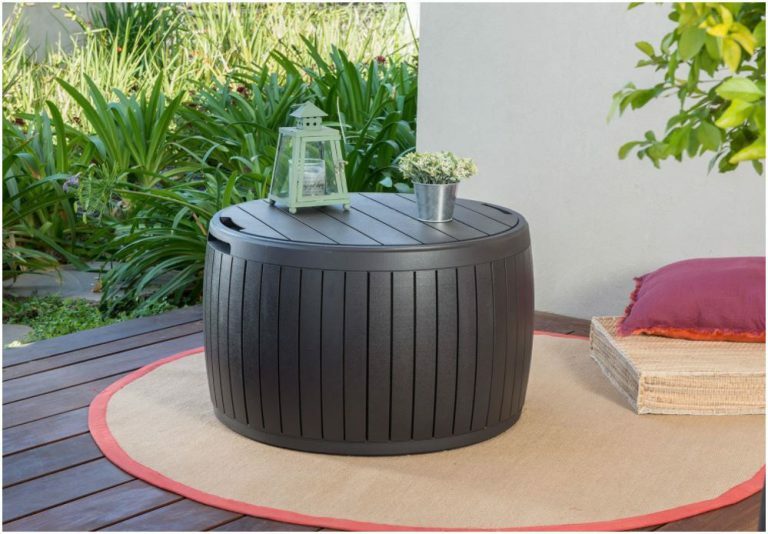 I will buy one for sure as it had good space inside to keep things and at the same time it looks really good and we have use it as garden table as well. Small,good enough space inside, stylish and looks good in little gardens, what else could I ask for…Thank you. 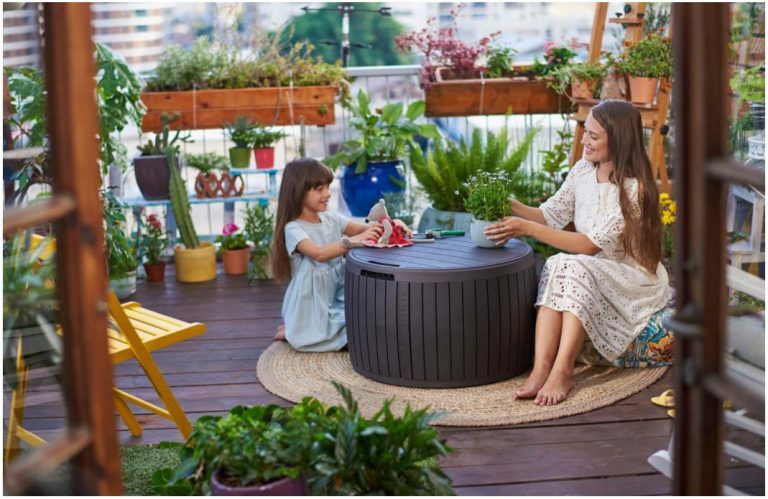 Hey Sarah, round deck boxes are quite rare on the market and like you say this model takes up little space making it ideal for confined patios and positioning on balconies. Many do use this box either as a centrepiece table between a chair set or a side table however you’re able to swiftly create a bistro set if you’ve a couple of outdoor seating chairs that match or two-tone the oak shade. When we looked out for a deck box, we searched for one with a flat lid for table-top services alike this Circa provides. Being able to put your drinks on and alfresco dine safely without cutlery & glasses sliding, along with storing your furniture cushions inside makes deck boxes highly convenient for our concerns. Okay, this store-capacity is only 37 gallons, have a check with the measurements to see whether storage fits in. If you’re after a compartment to shelter a few seating cushions and the odd accessory, you’ll probably find the dimensions suit a treat.